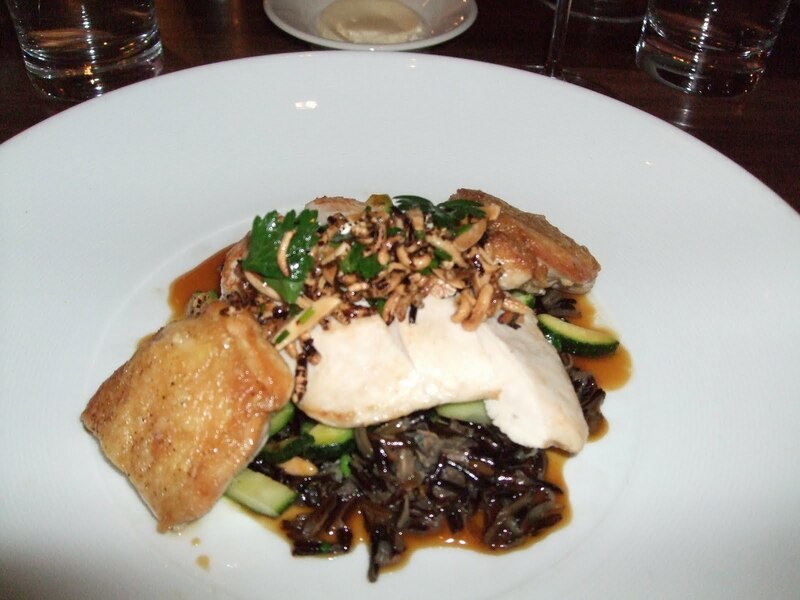 We love Local 127 in downtown Cincinnati for farm-to-table dining. 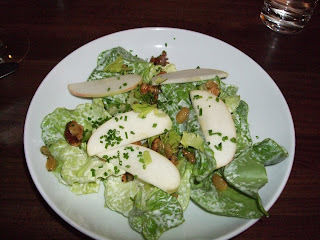 Another worthy entry on the locavore scene is Chalk Food & Wine in Covington, helmed by Chef Mark Bodenstein. George and I went with our friends (Corina and Michael) for a mid-summer dinner this weekend. This may sound strange, but the best thing I had -- or most unusual and memorable, at least, was my cocktail (Cucumber Agua Fresca, see sidebar). However, my dining companions were also pretty darn thrilled with their food. George was the most ambitious, ordering the "Farmers Feast," a "3-course chef tasting menu centered around local ingredients," and opted for the wine pairing with each course. His favorite was the "pork trotter" (used to be called pigs' feet -- we thought the updated nomenclature was a hoot) with zucchini ribbons, top photo. 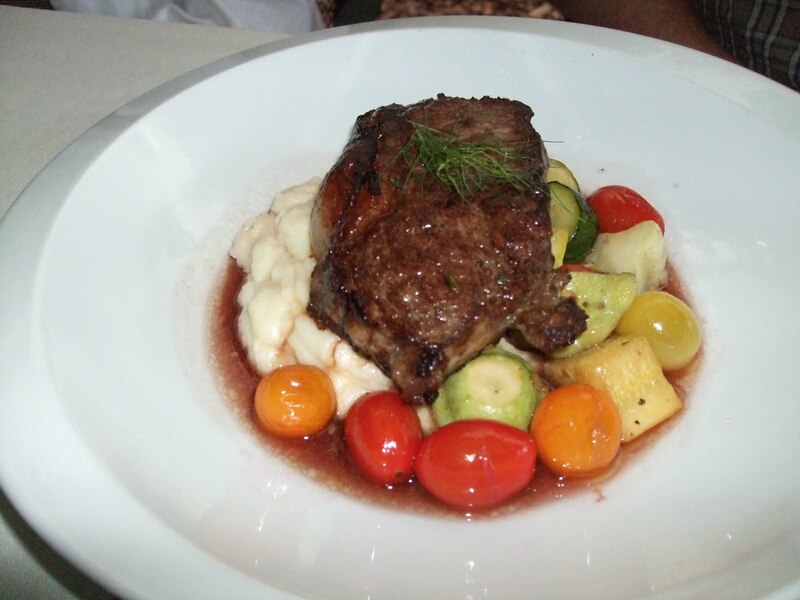 Our friends split the Martin Farm Prime Black Angus sirloin steak (second photo), accompanied by an array of gorgeous local baby squash, sun gold tomatoes and pureed potatoes. They loved it. For dessert, George and I split the blueberry Clafoutis (bottom photo), a simple baked batter cake with pistachio gelato. We sat out back on the vine-covered patio, enjoying the cool evening, good conversation and various wines. "Chalk Food + Wine is proud to support as many local farms as possible to bring you the best, freshest and most healthful food available," the menu says. What more could a healthy foodie possibly want? According to the Cincinnati Enquirer article today, the much anticipated Jean-Robert's Table will open for business on August 10th (a Tuesday). The upscale casual, French-themed restaurant is at 713 Vine Street downtown, formerly a Longhorn Steakhouse and other eateries. This will be our city's most renowned chef's step away from high end fine dining. Polly Campbell's article lists some of the menu options, so if you're interested, click on the link above to read all about it. At the peak of summer, all the markets are filled with what seems like dozens of fresh veggies. While it's best to eat a variety of foods -- buy and eat them all, if you have the urge -- sometimes it can seem like we have too many choice. Here's fresh news about which vegetables have the most anti-oxidants (disease-fighting substances) and therefore deserve starring roles on our plates. A recent study of close to 30 different types of veggies put these three at the top of the list: broccoli, beets, and bell peppers (the red kind). Yep, the top-notch veggies all start with B. Makes it easier to remember, doesn't it? The recent tests measuring total antioxidant content of the veggies revealed that they were particularly high in phenols -- that category of disease-fighting plant compounds that does everything from bolstering artery function to inhibiting the kind of cell damage that might lead to cancer or Alzheimer's. Broccoli and bell peppers are also a top source of antioxidant vitamin C. And beets are full of blood-pressure-friendly potassium. Though broccoli, bell peppers, and beets were tops in the recent study, it turns out we get most of our antioxidants from . . . potatoes. Not because they are more nutritious, but because we eat so many of them. (Alas, mostly French fries, too.) So the next time you reach for the potato sack for your side dish, try one of these recipes on for size instead. Skip the usual potato salad at your next picnic and serve this quick 20-minute salad: Broccoli Slaw. Forget the baked potato and make this: Lemon-Herb Roasted Beets. Bright bell peppers become a colorful side or vegetarian main with this recipe: Greek Orzo Stuffed Peppers. Here is a favorite summer dish--best in summer primarily because you can get fresh okra--now coming in to our local markets. Serve over rice, and add plenty of hot sauce, to your taste. Smells heavenly, tastes just as good: what is it? 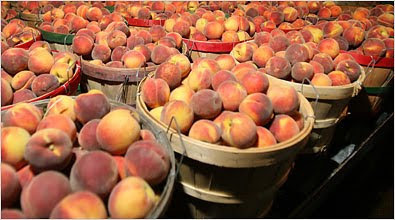 Peaches are one of mid-summer's many delicious benefits. 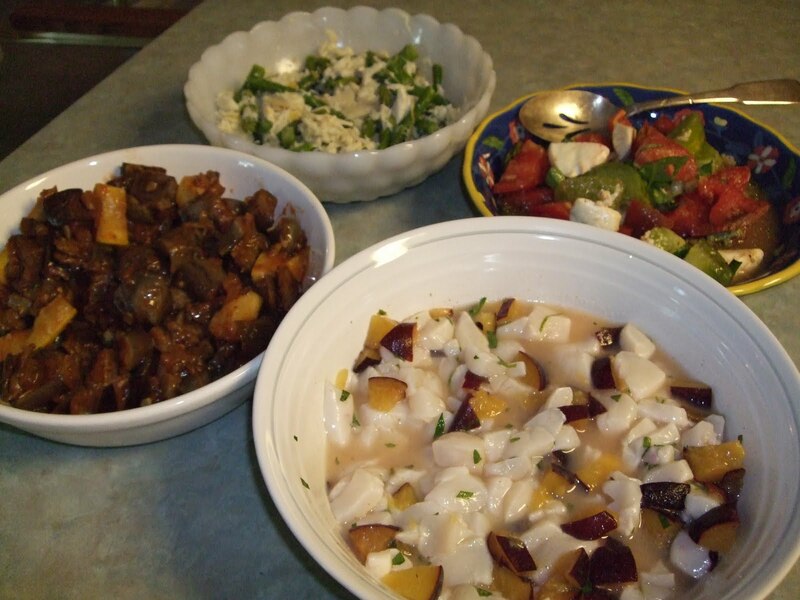 Here are a couple of recipes to help you enjoy them! Light sour cream, for serving (optional). 1. Heat toaster oven to 375 degrees on bake setting for 5 minutes. In a small bowl mash together butter, sugar, basil, cinnamon and salt. 2. 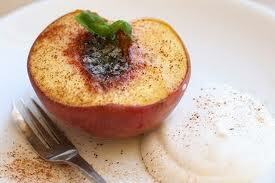 Spoon mixture into cavities of peach halves, and arrange peaches stuffed side up on toaster oven's baking pan with rim. Bake until peaches are softened and butter is bubbling, about 20 minutes. 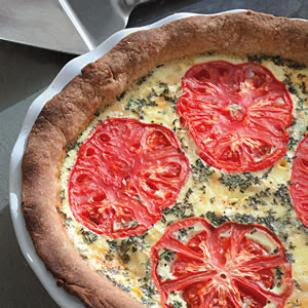 Serve hot, warm or at room temperature, with crème fraîche or sour cream. The secret to grilling chicken is a combination of low heat, indirect grilling (in which the food is set off from, not over, the coals), and a final blast of hot, direct heat. 1. Start a charcoal, wood or gas fire in a grill big enough to bank coals to one side once they get hot. With a gas grill, turn heat to high on one side and leave other side off; if there are three burners, you can set the two side ones to medium or even low and cook in the middle. When grill is hot, put chicken on least hot part, skin-side up, and cover grill. Let chicken cook for about 20 minutes. 2. When bottom of chicken is lightly seared and meat is beginning to look cooked, turn meat over in the same part of grill. Cover again and check after about 10 minutes. When skin is lightly browned, turn again. Continue to cook in the least hot part of grill until chicken looks close to done. 3. At this point, you can set chicken aside for a couple of hours, if you wish. When ready to serve, move chicken to hot side of grill. With a gas grill, simply ignite the burner that is under chicken. Cook attentively, turning chicken until it is brown and crisp all over, 5 to 10 minutes. Serve hot, warm or at room temperature; just before serving, drizzle with lemon juice and sprinkle with salt and lots of pepper. Serve with the salsa. Mix all ingredients together in a bowl. Cover and chill for 30 minutes to allow flavors to blend. Serve chilled or (better, I think) at room temperature. Most everyone gets hungry between meals -- I know I do. But snacking can add way too many calories to a daily total. Here are a few helpful tips about how to snack wisely, from my standby source, Eating Well Magazine. Keep chewing. One study found that people who chewed almonds thoroughly (up to 40 chews) felt full longer than those who chewed the same amount of nuts fewer times. Snack on citrus. Grapefruit’s “diet food” rep might be justified: one study found that when people simply ate grapefruit with each meal, they lost up to 3 1/2 pounds over three months. Grapefruit may help manage appetite by lowering insulin levels, say researchers. Keep chickpeas in the pantry. 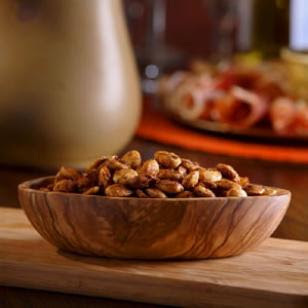 They have a meaty texture and a nutty flavor along with plenty of satiating fiber and a little protein—perfect when you’re watching your weight. Include a treat every day. Believe it or not, giving yourself little treats may be the secret to losing weight—for good. Aiming to be “too good” sets you up to fail. If you like a glass of wine with dinner, make room for it. Prefer dessert? Skip the drink and go for a low-calorie chocolate treat instead. Snack (and multitask) mindfully. Munching mindlessly in front of the TV is a surefire way to gain unnecessary pounds—but that doesn’t mean you can never enjoy your favorite program over a bowl of freshly popped popcorn or (fill in your favorite snack). Instead of popping a big bag of microwave popcorn, for example, choose a “mini” 100-calorie bag. And be sure to account for those calories elsewhere in your day. Use snacks to fill nutritional gaps. Make your snacks count. Choose those that provide calcium and fiber—two nutrients that people often skimp on. Two snacks to try: a cup of yogurt with a half-cup of whole-grain cereal mixed in, or a skim latte plus an apple. Brown-bag your snack. Skip the vending machine and satisfy the afternoon “munchies” with a healthy snack you packed at home. You’ll save money and get a bigger bang for your nutritional buck. Try an ounce of almonds and an orange or a handful of pretzels with some hummus. Planning snacks that provide both carbohydrates and protein will help tide you over until dinner. Choose your “midnight” snack wisely. If a good night’s sleep is what you crave, there may be a food combination to help. Specialists recommend a pre-slumber snack that’s rich in carbohydrates and contains a bit of protein; this combination is said to increase the tryptophan levels in the brain, causing you to sleep more soundly. 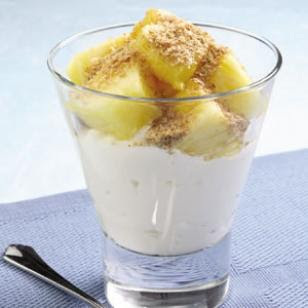 Try low-fat yogurt with a sprinkle of granola, a small bowl of oatmeal or a sliced apple with a bit of peanut butter. Don’t get tripped up by travel. However often you fly, prepare in advance so you’ll have healthy snacks to eat en route. For shorter flights, pack a quarter-cup of dried fruit, such as apricots, a handful of almonds and a few whole-wheat crackers as healthier alternatives to the salty snacks served in-flight. Sip plenty of water; low humidity and recirculating cabin air can be dehydrating. We always have the grandest time at Boca, and last Saturday was no exception. First, a cocktail at the bar -- from their short but intriguing list of house cocktails -- and then we settled in the dining room. 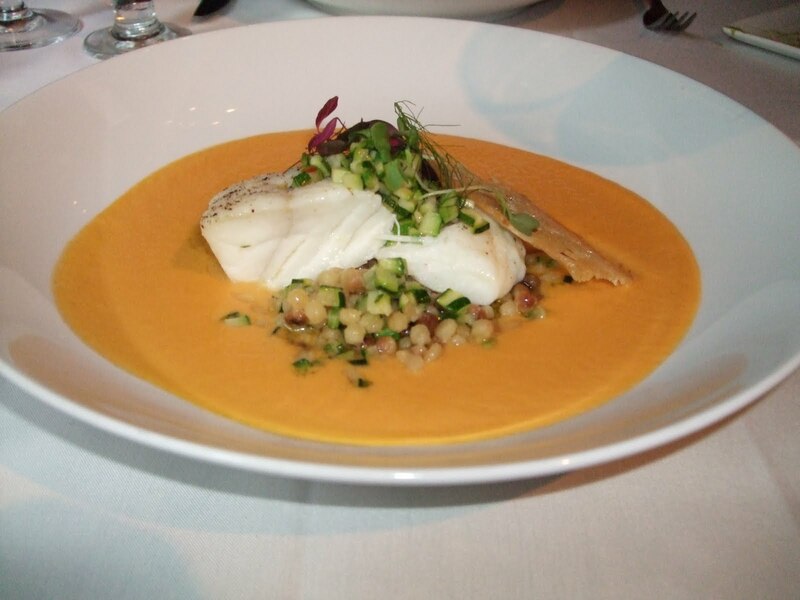 The restaurant offers only fixed-price meals -- either two or three courses, plus dessert. Hubby did three, I did two, which ended up meaning he got a plate of pasta with white clam sauce and I did not. 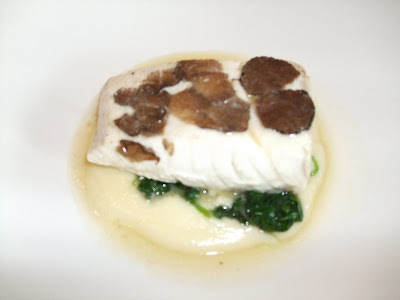 He also opted for the halibut cooked sous vide -- the latest in trendy preparations -- with shaved truffles on top. 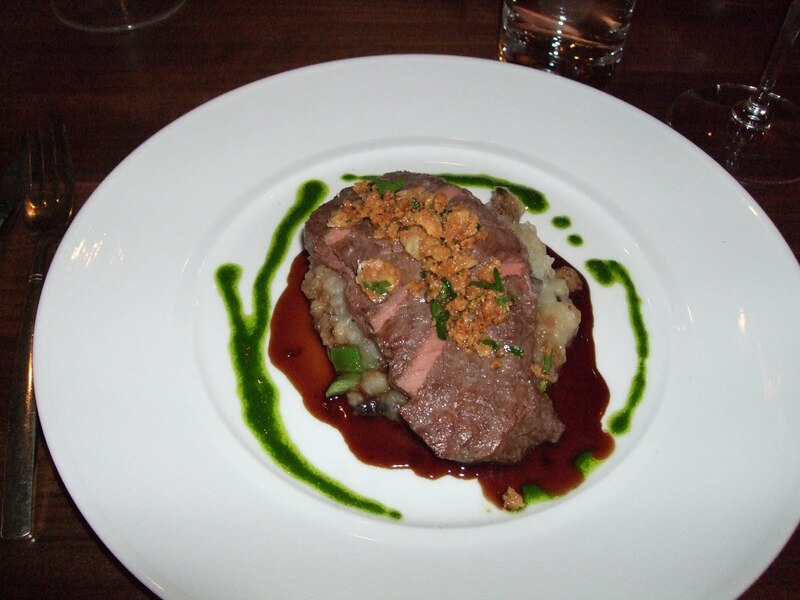 Something carnivorous came over me and I ordered a steak, yummy of course but quite a heavy dish with its sauces. With wines to accompany most dishes, it added up to a fine evening, although a pricey one, as expected. We don't go that often, so we can justify the cost-- plus, it was his birthday. 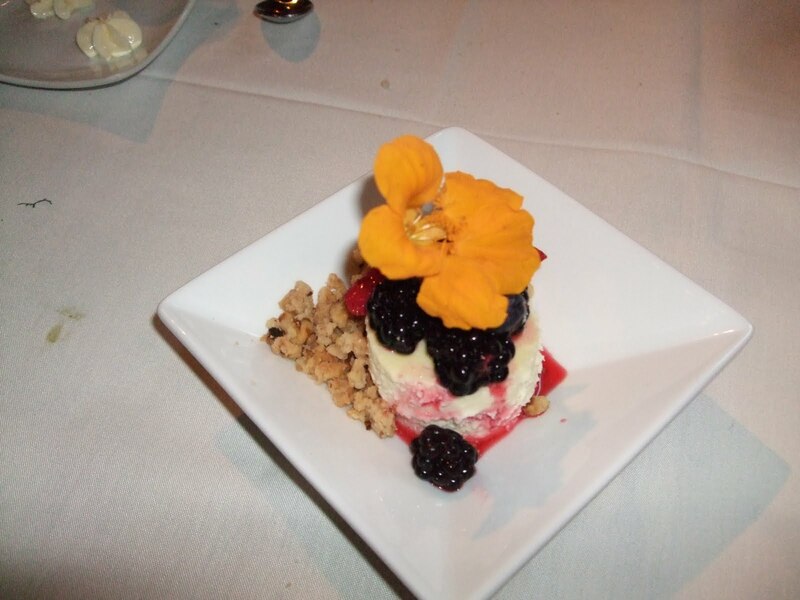 The staff treats you very well at Boca, making it our favorite Cincinnati night of fine dining. 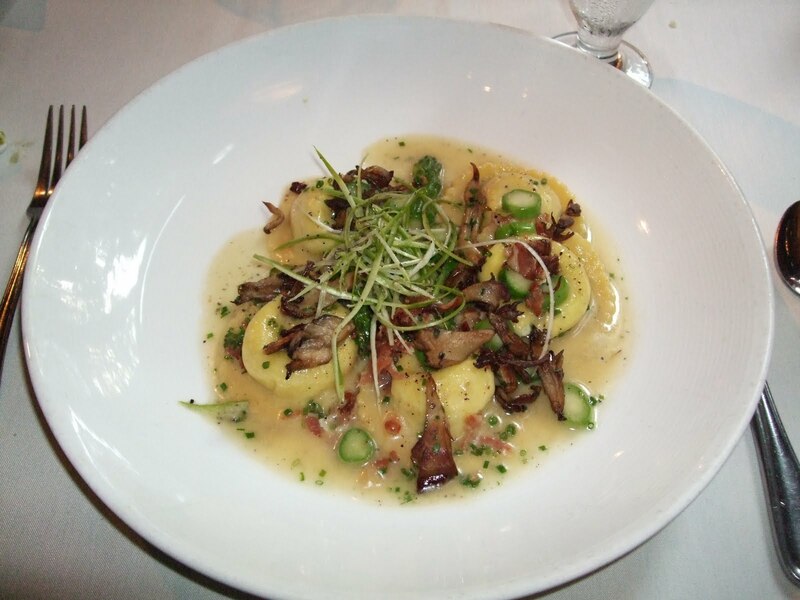 New menu at Boca -- but one other change cries out to be made! We had a splendid dinner last night at my husband's favorite Cincinnati restaurant, the marvelous Boca. I'll post details soon, but for now just wanted to mention that the restaurant debuted a new menu this week with some outstanding choices. 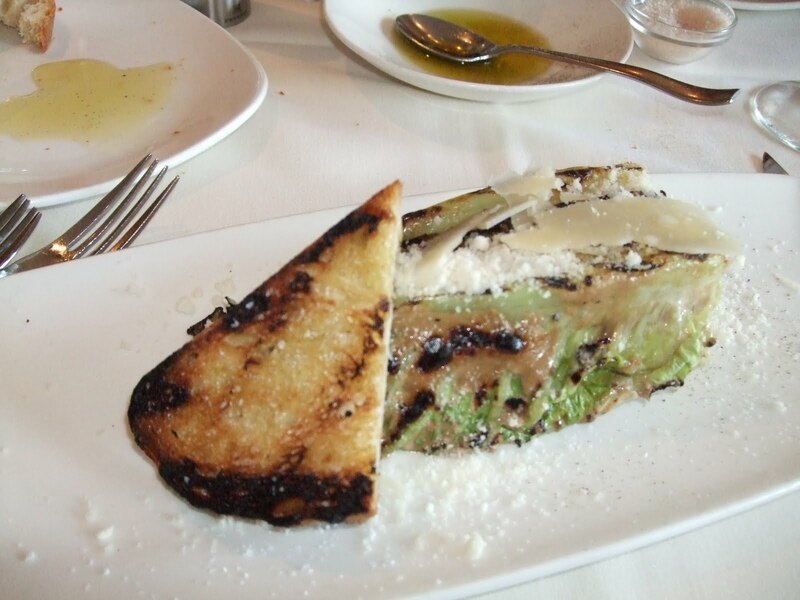 They kept two of the most popular starters -- their Caesar salad (with grilled romaine) and the signature diver scallops with caramelized Brussels sprouts -- but revamped just about everything else. The only disappointment is the tired dessert menu. 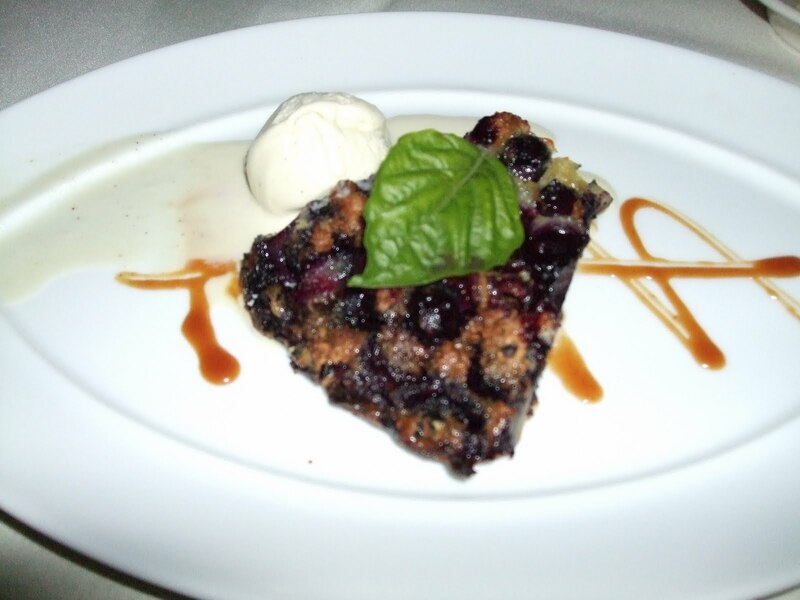 According to one of the staffers, they've had the same 5-6 desserts for EIGHT YEARS. I've had every one of them at least once, and given that dessert is included in both of the prix-fixe menus, diners have no choice but to order one of them again. My "Boca negra" (a cold, dense disk of dark chocolate) was just about inedible. Really this is not excusable at such an otherwise flawless high-end restaurant. But having vented about that, with my next post I'll share what was special about the evening (virtually everything BUT dessert....). Tomato-and-mozzarella salad (caprese) is one of the simple pleasures of summer. This week, I added cubes of cantaloupe and we loved the sweet flavor boost. With a minimum of oil -- actually, I didn't add any -- it was a low-calorie delight. 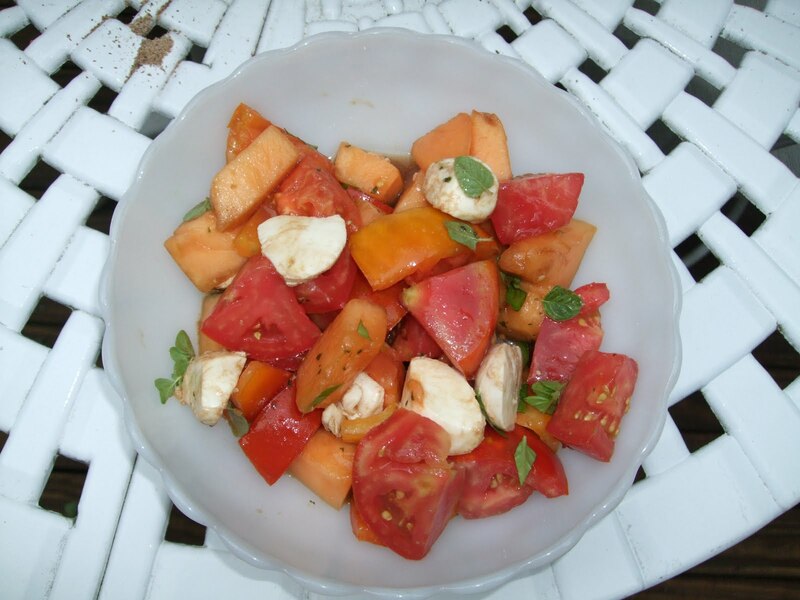 In a large bowl, gently stir the tomatoes, cheese cubes and cantaloupe. Sprinkle the basil on top, then the other ingredients. Toss gently and serve immediately. Note: You can refrigerate the salad for a couple of hours if you need to, but tomatoes are never as good once they've been refrigerated. The whole thing tastes best at room temperature! Got (something other than) milk? From the Berkeley Wellness Letter, here's some info about various types of non-dairy beverages that can make good substitutes for plain old milk. Cow’s milk is a good source of protein, calcium, potassium, and vitamin D. But if you are lactose intolerant or just don’t like regular milk, there are other “milks” you can try. Nondairy beverages—made from soy, nuts, rice, even oats and hemp—are not nutritionally equivalent to milk. Each has something to offer, though. Soy milk: Made by soaking, crushing, cooking, and straining soybeans, some soy milks provide as much protein as cow’s milk, often some fiber (dairy milk has none), a range of nutrients (including B vitamins and potassium), and isoflavones (potentially healthful plant compounds). Nut milk: Often made from ground almonds or hazelnuts, nut milks have little protein, but are relatively low in calories and provide vitamin E, manganese, magnesium, copper, and other nutrients from nuts. Rice milk: Consisting mostly of carbohydrates, rice milk is low in protein and fat (some have added vegetable oil). Though usually made from brown rice, the “milk” has no fiber and is thin in consistency. Rice milk is naturally sweeter than other nondairy beverages and least likely to cause allergies. Oat milk: Made from oat groats (oats that have been cleaned, toasted, and hulled), oat milk contains about half the protein of cow’s milk. Oat bran may be added as a source of fiber. It’s slightly sweet with a thin consistency, similar to skim or 1% milk. Hemp milk: From the seeds of the industrial hemp plant (varieties of Cannabis sativa grown for food and textile uses), hemp milk supplies protein, omega-3 fats similar to those in flaxseeds, and other healthful unsaturated fats. Unlike the Cannabis plant that produces marijuana, foods made from hemp contain only trace amounts, if any, of the psychoactive compound. 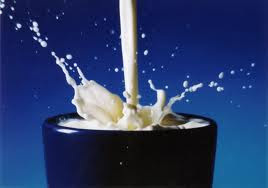 • If you drink nondairy beverages in place of cow’s milk, look for ones with added calcium and vitamin D. Many are also fortified with vitamin B12 (an advantage for vegans who don’t get much B12 in their diets) and other nutrients. • Most nondairy beverages are sweetened with sugar (such as evaporated cane juice, rice syrup, or barley malt), which increases calories. Chocolate and other flavored beverages have even more added sugar than “plain” or “original” ones—as much as five teaspoons a cup—and up to 170 calories. Unsweetened versions have as few as 35 calories a cup. • Though the unsaturated fat in these beverages is heart-healthy, nonfat versions have fewer calories. 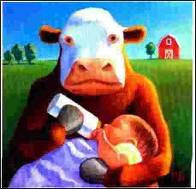 • Nondairy beverages, including soy milk, are not a replacement for infant formula. What to do with all these marvelous tomatoes? 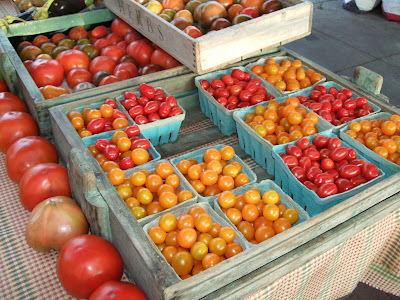 Lots of fresh tomatoes: it's a great problem to have. Tomato season is so short, really -- just a couple of months at most. Here in Ohio, the many beautiful heirloom varieties are showing up at all our farmers' markets and even in some supermarkets. I buy some twice a week: on Saturdays at Findlay Market, and a supplemental supply at the Northside Market on Wednesday afternoons. Most of the time, we eat them sliced with a little salt and pepper, maybe some olive oil. Once a week or so I'll cut them into wedges, add chunks of fresh mozzarella and drizzle the dish with olive oil, high quality balsamic vinegar and chopped basil. However, there may be times when you'd like to use your lovely tomatoes for something a little different. 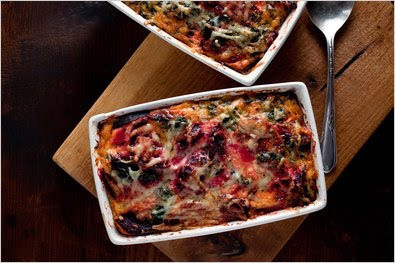 Check out this recipe for tomato and corn pie. Note: If you're not up for making a crust from scratch, buy a good quality, whole-wheat crust from a good grocery store, such as Trader Joe's or Bigg's (my favorites where we live). If you're not making a crust, start the recipe at Step 4, but be sure to bake the crust before you add the filling. Not much of a tofu fan? Maybe you should give it another try. Here's a link to a whole bunch of recipes that use all kinds of tofu -- silken and firm -- and range from smoothies to main courses to tofu-and-walnut-stuffed mushrooms. W e've loved soybeans for a long time. Domesticated by the Chinese for more than 3,000 years, tofu, soy's most well-known byproduct, was first created by the Chinese more than 2,000 years ago. Tofu made its way throughout East Asia and Southeast Asia, gaining a foothold in many different cuisines. Nowadays, it's clear that this dietary staple of many a vegan and vegetarian—as well as other forms of soy such as edamame and soy milk—has made its way into the dietary mainstream. After our "tiki cocktail" class at Tonic on 4th last weekend, we took my brother next door to Local 127 for dinner. My bro, in from Raleigh NC, is a bona fide foodie and we wanted him to try one of our best farm-to-table eateries. As it turned out, he pronounced it his favorite restaurant in Cincinnati. Some of our good food is shown in these photos. Chef Geddes' take on Waldorf Salad is head and shoulders above the ordinary, mayonnaise laden glop served most places -- in fact, my eyes went right past it until I remembered having it there before and thinking it was great. My brother's Risotto with Smoked Chicken, Lemon and Basil had him almost licking the plate -- "I could have eaten two of those," he said. For entrees, both my husband and brother selected the tender, delicious Chicken Two Ways, while I scarfed up melt-in-your-mouth Bison Rib-Eye with Snow Peas and Potatoes. Yes, we had dessert -- not photographed: panna cotta and a fine dark chocolate pudding. Craving a sweet treat? Of course, we know we should reach for fruit instead of candy or ice cream, and that's easier than ever in summer because so many yummy fruits are in season. But here's a sweet bite you probably haven't thought about. It's portable, not perishable, and available year round. Yes, I'm talking about the humble prune. The docs at Real Age remind us that with their high fiber content, prunes help us to feel full and make it less likely we'll overeat at mealtime. Here's some of what they have to say about the benefits of prunes, aka dried plums. So what gives prunes the advantage in edging out hunger? It's the fiber. Even though each test snack had roughly the same amount of protein, calories, carbs, and fat, the prune snack packed more than twice the fiber. That chewy fiber makes you eat more slowly, allowing your brain to realize when you've had enough to eat. And the roughage sits in your stomach for a long time, slowing down digestion. The fiber also reduces the rate at which sugar is soaked up into your bloodstream -- good for keeping insulin levels on an even keel and reducing between-meal hunger pangs. When you don't want to heat up the kitchen, go for a cold supper. I made this meal for company over the weekend, and only one of these four dishes required significant cooking -- so I made it the day before. 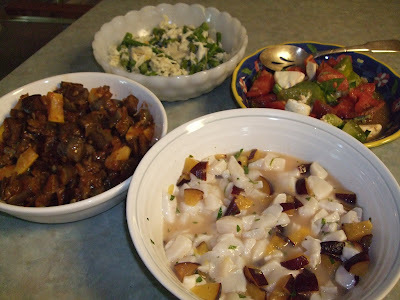 Supper consisted of heirloom tomato and fresh mozzarella salad (just add olive oil, chopped fresh basil, balsamic vinegar, salt and pepper), eggplant caponata (this required sauteing sliced local eggplant and summer squash in olive oil, cooling, then mixing with canned tomatoes, capers, garlic and green olives -- served at room temp), and two cold seafood dishes, recipes below. We also had a couple of crisp white wines, fresh cheeses and multigrain cibatta bread. The meal was a complete hit! Blanch asparagus in salted boiling water for 2-3 minutes, drain and plunge into cold water. Drain again and pat dry. 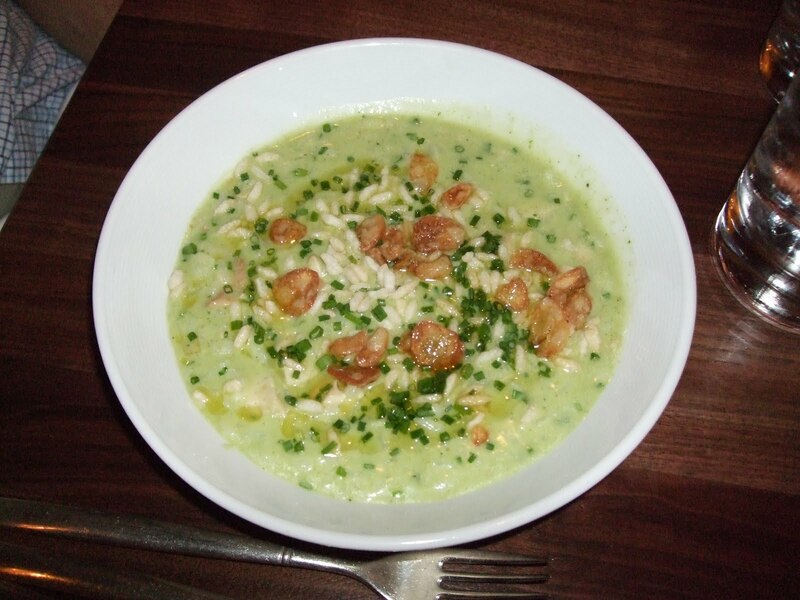 In a large bowl, combine asparagus with the crab meat.In a large bowl, combine asparagus with the crab meat. Sprinkle the zest from both lemons into the bowl and stir gently. Add olive oil and stir gently again. Cover and chill for a few hours. Just before serving, remove bowl from the fridge and add lemon juice, stirring again. Add salt and pepper, and top with cheese strips. In a bowl, toss together scallops, plums, tarragon, lime juice and zest. Season wit salt and cayenne. Let mixture sit at room temp for about 15 minutes. To celebrate our 15th wedding anniversary (yay! ), we made our way back to Cincinnati's best true Italian, fine-dining choice -- Nicola's. Always high on Cincinnati Magazine's annual list of top restaurants, it's owned and operated by the same Italian family that runs the more casual Via Vite on Fountain Square. We hadn't tried Nicola's in years and it was great to return. The meal was excellent. My husband was ready to try everything, so he opted for one of the tasting menus, a four-course feast, with a small glass of wine to accompany each course ($70). I wasn't ready for that much food and wine, so I had a nice arugula, shaved Parmesan and prosciutto salad ($12) followed by asparagus and goat cheese ravioli ($27), which was delicious and a lot lighter than it looked on the plate. The top photo is the ravioli, followed by my husband's halibut, my salad, and his dessert. As you can see, the prices definitely put Nicola's in the fine-dining, special occasion realm. (Not that there's anything wrong with that.) We vowed to return a lot sooner this time! This salad was in the Times about a week ago, and is atop their list of most emailed articles today. Since it's such a healthy dish, I thought I'd reproduce it here for my readers. 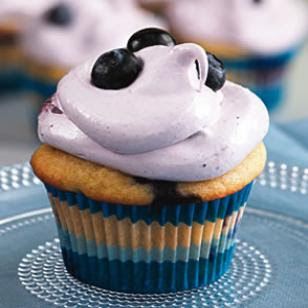 Ode to the Blueberry -- Try these Cupcakes! There's no better food on earth, IMHO, than the beautiful blueberry. In season -- NOW!! -- the little sweet things are part of my everyday diet. They always appear at breakfast, either in a bowl with pieces of cantaloupe and other berries, or in cold cereal or oatmeal. On special days, they make it into pancakes or muffins, and we like the blueberry cornbread you can find sometimes at Whole Foods. Here's a recipe I found for blueberry cupcakes that has a secret ingredient for the cake -- mashed potatoes! The potatoes make the cake incredibly moist, and the frosting is so guilt-free that you can pile a lot on each one. Note that the frosting stiffens quickly, so frost the cupcakes right away. 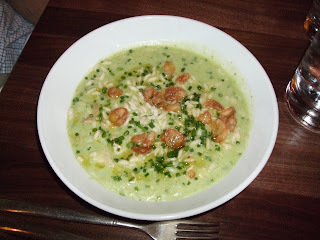 This recipe was adapted from one of my favorite healthy-foodie sources, Eating Well magazine. Whisk whole-wheat flour, cake flour, baking powder, baking soda and 1/2 teaspoon salt in a medium bowl. Beat granulated sugar and oil in a large mixing bowl with an electric mixer on medium speed until combined. Beat in egg, 1/2 teaspoon extract and the 3/4 cup mashed potatoes until combined. With the mixer on low, alternately mix in the dry ingredients and buttermilk, starting and ending with dry ingredients and scraping the sides of the bowl as needed, until just combined. Fold in 1 cup blueberries. Divide the batter among the prepared cups (they will be full). To prepare frosting: Once the cupcakes are cool, bring 2 inches of water to a simmer in the bottom of a double boiler (see Tip). Combine 3/4 cup granulated sugar and 3 tablespoons water in the top of the double boiler. Place over the simmering water and heat, stirring, until the sugar is melted, 2 to 3 minutes. Start beating the mixture with an electric mixer on high speed; add reconstituted egg whites, cream of tartar and a pinch of salt. Continue beating until the mixture looks like a glossy, thick frosting, 5 to 7 minutes. Off the heat, beat for 1 minute more to cool. Add 2 tablespoons (or more, depending on desired color) blueberry preserves (or jam) and 1/4 teaspoon extract and beat on low just to combine. Spread or pipe the frosting on the cooled cupcakes and decorate with fresh blueberries on top, if desired. This lentil-and-vegetable burger from World Food Bar at Findlay Market made a good supper for us the other night. It's fully cooked, and just needs a quick saute (or grilling) on medium-high heat with a little oil. The higher heat gives it some crust. Then reduce the temperature and cover it for a few more minutes to heat all the way through. 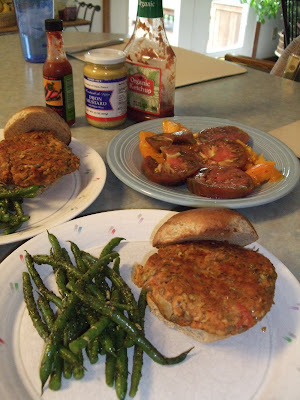 We had them on whole wheat buns with fresh tomatoes, and a side of locally grown green beans with homemade pesto. One way to make almost any dish interesting is to make sure it includes ingredients with different textures. I have been impressed with the way Local 127 Chef Stephen Geddes uses crispy accents in almost all of his cooking, including even desserts. Ever since a meal we had at his restaurant a couple of months ago, I've been a lot more aware of texture in cooking. Of course, flavor contrasts are important, too. Here's a recipe for a rather addictive Indian snack that marries a lot of contrasting flavors and textures. It's from famed Seattle super-chef Jerry Traunfield, who calls it Spice Crispies. 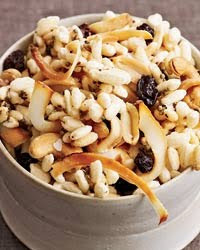 In a large bowl, toss together the cereal, nuts, coconut flakes and raisins. Meanwhile, heat the oil over medium-high heat in a saucepan, just until it starts to shimmer. Add the mustard seed and cook until the seeds begin to pop, about one minute. Add the next four ingredients (fennel through bay leaves) and cook, stirring, for another minute. Immediately drizzle the oil and spice mixture over the cereal, tossing to coat well. 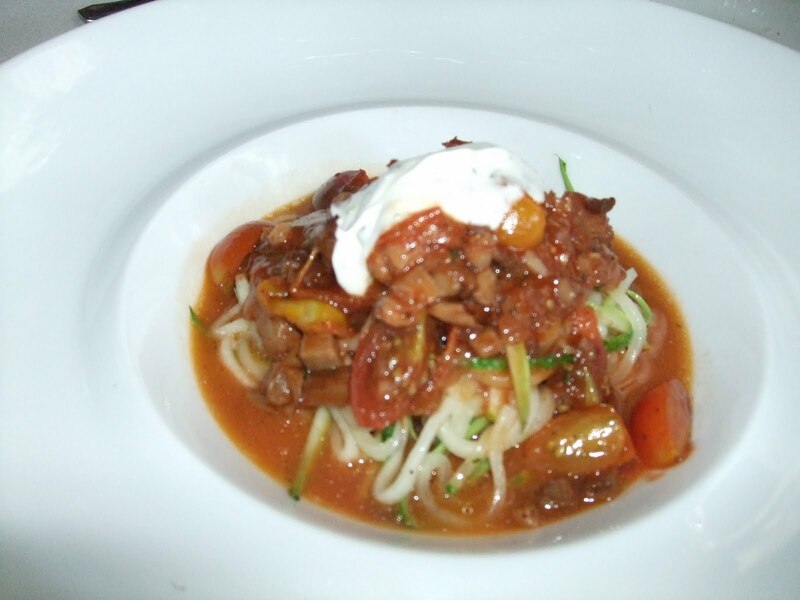 You can also place the completed dish into an airtight container and store at room temperature for up to four days. It's midsummer and the growing season is in high gear. My Saturday visit to Findlay Market -- Cincinnati's premier farmers' market, although there are many other good ones -- yielded fresh foods that either hadn't been available a couple weeks earlier, or there were more vendors with what had been quite scarce on previous visits. This week's great additions included more varieties of heirloom tomatoes (see photo); every type of berry, even including one farmer who had strawberries; several varieties of green beans; and plenty of corn. 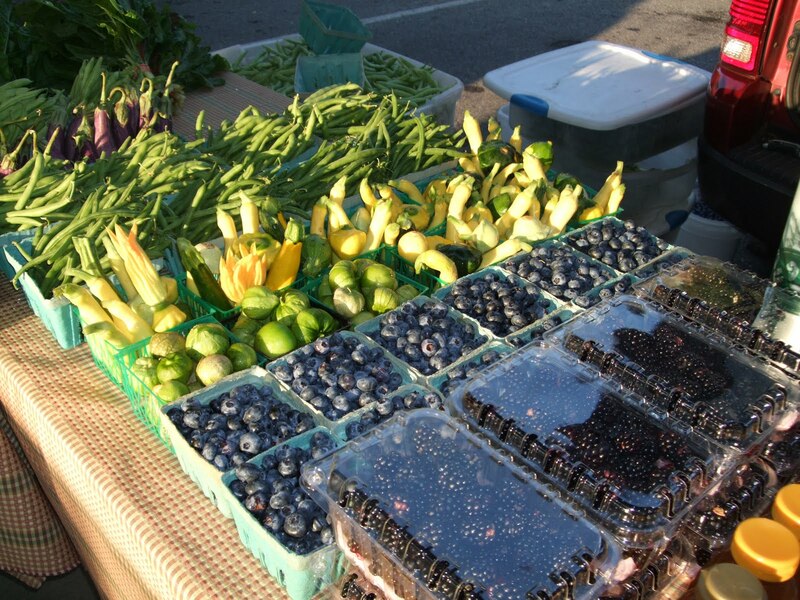 Most of our markets take food stamps, and folks from all walks of life shop for these wonderful treats. All in all, there's really no reason not to eat healthfully this time of year. We dropped in for dinner on their second night of operation and had plenty of company. There are a few special cocktails and an array of small plates, all within about $6 - $15, along with a short wine list. We started with guacamole and chips -- tasty, although the guac could have had more kick, IMHO. My guava cooler was perfect with the salty tortilla chips; my husband had a bottle of Mexican beer. 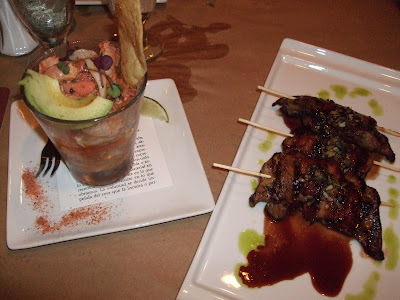 We split three small plates after that: excellent shrimp and calamari seviche, grilled chicken skewers with an interesting, sweet sauce, and a Mexican corn stew called pozole. We also each had a glass of wine. Somehow, this added up to $71 plus tip. (Not too surprising, I guess, given the way that drinks and glasses of wine add up!) It was satisfying, though, and as far as we could tell, the food was going over well at neighboring tables. I predict it will be a hit, given how people love Mexican food and this is a worthy, non-ordinary version of the cuisine. In Lincoln Park, a near suburb of Chicago, we made a return visit after several years to Cafe Ba Ba Reeba, a Spanish & otherwise Latin, indoor/outdoor establishment on North Halsted Street. The cocktails were good -- everything from 5-6 types of sangria (our fave was the passion fruit) to excellent house margaritas. We did not try the paella -- next time, for sure -- but stuck with the smaller tapas plates. 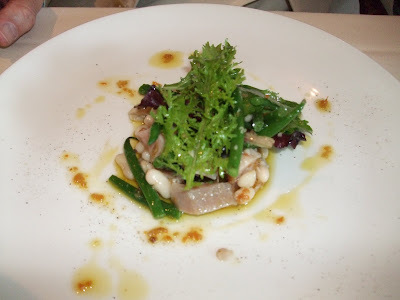 The portions discourage gluttony, and there were plenty of healthier, light dishes. Shown above is an heirloom tomato salad and a smoked salmon dish. If you ever happen into a Qdoba Mexican Grill, you're likely to get a Chipotle deja-vu. The menu seems quite similar and upon just one visit, I wasn't able to discern anything other than a Chipotle knockoff. Not that there's anything wrong with that. I'm a pretty big fan of the grub at Chipotle -- especially soft tacos, a healthier option than fried ones, cheesy quesadillas, or massive burritos -- and you may find a Qdoba where no Chipotle exists. There are several in metro Cincinnati, although none are close to my in-town orbit. I ended up trying it in suburban Chicago. Click here to find a location near you: Qdoba location finder. We had the new Mango Salad, which you can have "naked" (without the fried tortilla shell) or whole hog. We tried the whole version but didn't eat much of the shell. As with anything else you order here, you choose your ingredients. The only real difference for this dish is a mild, mango-rich salsa topping. We both liked and would recommend it. You might think of beets as a winter veggie, but perhaps surprisingly, this is the time to find locally grown beets -- both red and golden -- at many farm markets. This recipe from the New York Times health pages will delight even the non-beet fans. Give it a try! 1. Roast the beets. Remove from the heat and allow to cool, then cut the ends off, slip off the skins and slice across the equator. 2. Bring a large pot of water to a boil while you stem and wash the greens in two changes of water. Fill a bowl with ice water. When the pot of water comes to a boil, salt generously and blanch the greens for about one minute. (You can also steam the greens until they wilt, one to two minutes). Transfer the greens to the ice water, then drain and squeeze out the water. Chop coarsely. 3. Heat the olive oil over medium heat in a medium skillet, and add the garlic. Cook for about 30 seconds, stirring, until fragrant. Stir in the greens. Stir together for a minute, season the greens with salt and pepper, and remove from the heat. 4. Preheat the oven to 375 degrees. Oil a 2-quart gratin or baking dish with olive oil. Beat together eggs, salt (about 1/2 teaspoon), pepper, milk, chives and the Gruyère. Gently stir in the greens and beets. Scrape into the gratin dish. Bake 35 to 40 minutes until set and lightly browned on the top. Allow to sit for 10 to 15 minutes before serving. Serve hot, warm or room temperature. Lighter Broccoli Salad -- just as yummy! 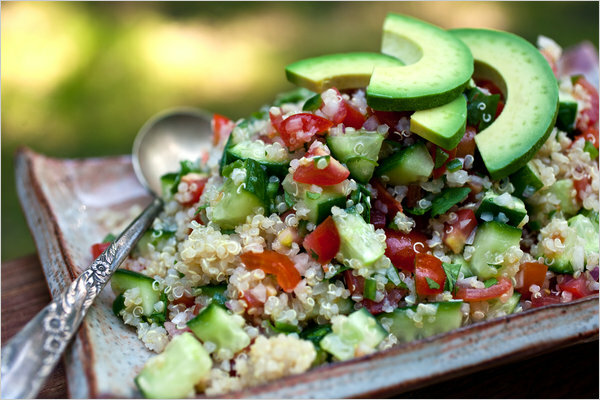 Broccoli salad is a summer favorite, perfect for cookouts and picnics. In a large bowl, whisk together garlic, mayo, sour cream, vinegar and sugar. Add broccoli, water chestnuts, bacon, cranberries and pepper. Stir well. Cover and refrigerate; serve cold. 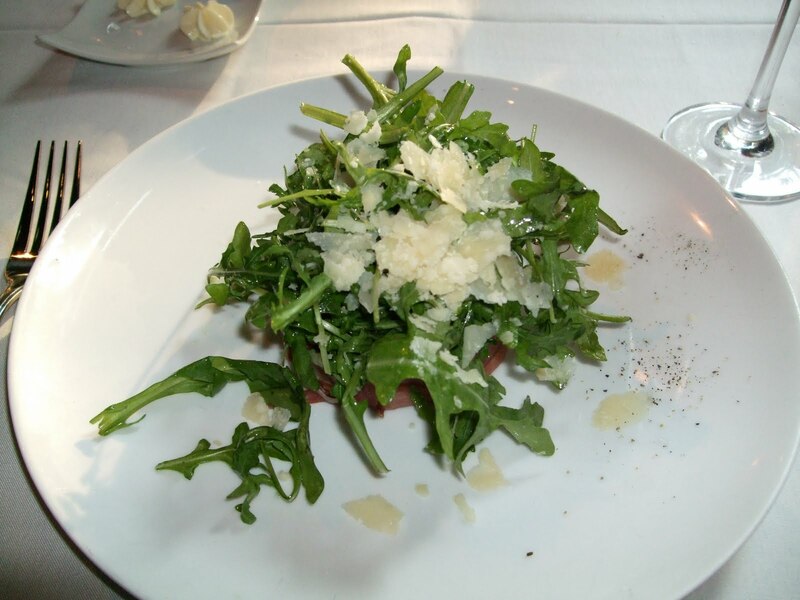 The salad can be made up to one day in advance and still taste great. Here's another guest healthy-foodie post -- from Shannon Wills, whose credentials and contact info are at the bottom of the article. Thanks, Shannon! · Drink lots of water: And finally, drink lots and lots of pure water even as you limit the amount of caffeine from tea, coffee and colas. Also steer clear of sugary drinks because they’re loaded with calories and provide zero nutrition most of the time. This guest post is contributed by Shannon Wills, she writes on the topic of physical therapy assistant schools . She welcomes your comments at her email id: shannonwills23@gmail.com. The battle of the bulge only gets tougher on weekends, holidays and vacations. I can be pretty darn good during the week, when I'm cooking at home, exercising routinely, and drinking alcohol very lightly if at all. Then Friday rolls around, the social calendar fills up, and all bets are off. If I can get on the scale Monday morning and have no change from Friday morning, I consider it a victory. Problem is, I gained a couple pounds on a recent vacation and need to be losing, not staying the same. What's the answer? Here's a tip from the folks at Real Age. I think their best advice is that we should keep a food diary on weekends -- write it down. That might be hard at a July 4th cookout party, but I'm betting that the payoff will be significant. Shall we try it this weekend? Q: Why is it that when I go on a healthy weight loss plan, I lose barely a pound a week, but after the weekend, I've gained back more than a pound! It feels like I can't go out and have a glass of wine and dessert occasionally because it will take me a month to undo the damage. A: You're a victim of the "weekend effect": extra pounds that suddenly appear on Monday morning and take weeks to lose. But it's not the glass of wine or occasional dessert that's creating those love handles you hate. On weekends, you're probably taking in way more calories than you realize. A 2008 study at Washington University School of Medicine found that dieters consistently gained weight on the weekends while losing weight during the week because they ate more on weekends. When you're kicking back, a few more chips and another margarita or a second slice of pizza-with-the-works seems okay because you were "good all week." You probably also eat out more on weekends, and at many restaurants, "single" portions are big enough to feed a family of three (seriously) yet find their way into your body of one. So here's our action plan for all weekends, not just one: Don't drop your guard on Friday night and pick it up again Monday morning. Walk more. (Try this walking workout at home). Try to lose a little on most weekends. And keep a food diary: Writing down what you eat, especially on weekends, will help you have that glass of wine with no regrets. 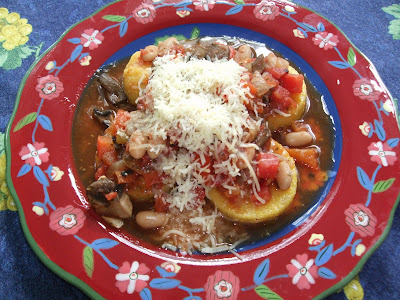 For a vegetarian supper, nothing beats beans with vegetables over sliced polenta. Just buy the already-cooked tube of polenta at the grocery store. Slice it into pieces about 1/12 inches thick and saute in a little olive oil. As a topping, simply saute onion, mushrooms, peppers and garlic. Add chopped tomatoes (canned or fresh), herbs and spices of your choice, and a can of drained and rinsed white or black beans. You can include more protein, such as sausage or chicken, if desired, but I prefer the vegetarian version. Spoon the hot topping over the polenta slices and sprinkle with a little cheese.